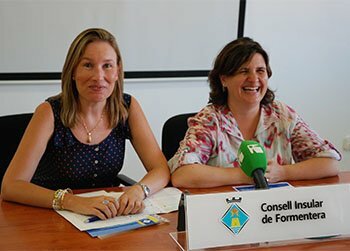 This morning in Formentera, Sònia Cardona, Formentera's councillor of culture, and Gemma Tur, coordinator of the graduate studies programme at the Universitat de les Illes Balears (UIB) in Formentera, unveiled details about the XIII annual Escola d'Estiu a Eivissa i Formentera, a summer session of university courses serving residents of the Pitiüsa Islands. New this year, collaboration between UIB and Formentera's office of culture on a course titled Introducció al Llenguatge Cinematogràfic a Formentera (Introduction to Cinematographic Language in Formentera) has led to what will be the first ever locally-imparted session of the course, set to take place on 6 September. Councillor Cardona hailed the fact that “opportunities like this bring the UIB closer to Formentera, and puts the University within the reach of people here.” She also highlighted other similar programmes – a university for the elderly and a recently constructed videoconference room – that were conceived as ways for Formentera students to participate in university studies. The class will be held at the hall of ceremonies (sala d'actes) of the offfice of culture from 10 am to 2 pm. Leading the session, Joan Marí, screenplay writer, producer and founding member of the production company Incortum and Enrique Villalonga, director, screenplay writer, producer and founder/director of the Filmotica production company. Marí's segment of the class will cover writing techniques and screenplay analysis while Villalonga's will focus on syntax and cinematographic narrative. Closing the joint lecture, a screening of the Villalonga-directed film “El hijo del taxidermista” (The Taxidermist's Son) followed by a debate. The 6 September session is one of five different conference-style classes comprising the XIII Universitat d'Estiu d'Eivissa i Formentera summer programme, a five-day series scheduled for 8 to 12 September. Enrolment – cost-free – will only be required in the case of those participants that wish to obtain a certificate of attendance. To enrol, interested individuals can call 971.39.80.20. For additional information, contact Sònia Cardona at 666.15.58.29.